PERFECTA CREME COLOR is the result of a long and intense research work in FAIPA COSMETICS' laboratories aimed at achieving a technical innovation in the coloring range which also considers the need to utterly safeguard the hair structure and simultaneously obtain a color that meets the expectations of the most demanding hairdressers. 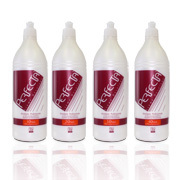 It is a technical innovation, that's why it is delicate on the hair, since it does not have ammonia's aggressiveness. The hair structure is protected and reinforced thanks to the keratin, which gives hair greater compactness and tensile strength, this means greater softness and smoothness at touch. Well closed and compact Keratin scales guarantee a better hold of color in time. The absence of ammonia makes the hairdresser's approach extremely pleasant for the customer and ensures better health in the beauty salon also for assistants in charge of applying tints, without annoying inhalations! 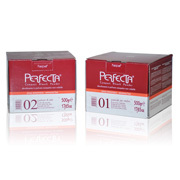 Perfecta Crème Color is a soft and gently product easy to blend with oxidants and to apply on hair. Formulated without ammonia and pleasant perfumed, contains hydrating substances, keratin and conditioners as olet 10, bee wax, lanoline, paraffin and soy oil that protects hair giving elasticity and brilliance after color application. 02 Gold with silk powder: It is suitable for total, medium bleaching on natural, colored hair and highlights. Fai Color is an innovative tone-on-tone hair color. Color and hair nutrition in one cream. Gentle color. It has no ammonia and no lift, while ensuring excellent coverage of grey hair without radically modifying the structure. The Aloe Vera produces an efficacious hydration, nutrient benefits, antioxidant action and is palliative and refreshing. Fashion contrast and tonalizations to brighten previously colored hair with unique and personal reflections. Ultra delicate Faicolor is to be used in beauty salons after a straightener application or applied after a permanent wave. All in 20 minutes. This is possible due to the 32 brilliant shades that you can mix each other. The series includes natural, golden, ash, vibrant and intense red shades, fashion chocolate shades and creates special trend effects. Faicolor…the world is color. Faicolor Developer is a steady oxidizing creamy emulsion, specifically created to interact with Faicolor and tone on tone colors. It has to be used one part of color and two parts of developer.